I sit here in my office of my struggling Independent media outlet. An outlet that was fair and friendly with you during the election. Even though we’re the largest in our market with large audiences in other key Ontario markets we received zero advertising from your campaign or the PC party during the election. We also didn’t receive any ad buys from Election Ontario. And in 2018 all media face the peril of an unregulated market that is seeing over 75% of ad dollars fleeing the province and country for social media ads like facebook. Let facebook cover your all candidates debate as you purchased an ad from them, but not us. You’ve been busy since you took office. While I didn’t vote for you I didn’t vote for Ms Wynne or the even worse Ms Horvath. I returned my ballot. Ontario has many issues and sadly, none of the three main parties earned my vote. You were close, but again, zero ads was a red flag that has now been light aflame by what appears to be your own inhouse news media. Does that mean more access for Dougie TV than say the CBC, or my humble outlet? 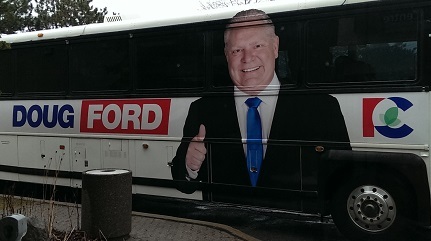 You have some positions I truly supported and frankly of the three party leaders you were the best candidate, but if you can’t grasp the importance of a strong independent media we’re in trouble in Ontario. Likewise, your cancelling of the Guaranteed Minimum Income is a very short sighted and non progressive move. In this day there simply are not good jobs to go around. There simply are not enough bad jobs even due to Ms Wynne jacking up Minimum Wage (see, we agreed on that one). With automation there will be even fewer jobs moving forward. A Guaranteed Income isn’t a hand out. It has the potential, and very real potential, to eliminate government waste and duplication of bureaucratic services, and that’s something I think we both agree on too. We need a social net. The offset damage in medical, judicial, policing, and other impacts on society are far greater without a net than with it. I know you focused on touring the province and chatting with people during the election. You did grant me an interview during the election which showed you’re not afraid to deal with we media folk. You’ve also been brave enough to change direction during the campaign. Guaranteed Incomes need to be reinstated and expanded. And you really need to fold your party “news” outlet. True story. During WWII Mr. Hitler and his friends had their own news outlet too. While watching movies during 1944 theatres were being bombed while newsreels shared how well the war was going. People have trust issues with media, but they have more trust issues with government controlled media. Just ask any Conservative what they think about the CBC. I can guarantee you that your “news” outlet will cost you the next election. While you may not like some of us media folk, and some didn’t treat you fairly, but that’s part of being in public life, it’s another area that you need to rethink with your team. You have a chance to make Ontario a better place. I know it might not be a better place for all, but we can have hope. We know you’ll lower hydro rates and get rid of the silly carbon tax. We know you’ll improve the economy, but we also know that we need Ontario to work for everyone just as this writer knows that if you don’t do the right thing sometimes your time as Premier will be a one term deal. Just some words from a journalist that treated you fairly hoping to simply get the same respect back for his industry and community. Bill you’re right. Media normally do that job, but if we don’t have the resources it makes it difficult. You nailed it Jamie. It’s getting scary to watch knuckle-dragging mouth-breathers being elected to positions of power. The last one we had in Ontario was Mike Harris. Economics 101 by Jules?? I don’t think so! !